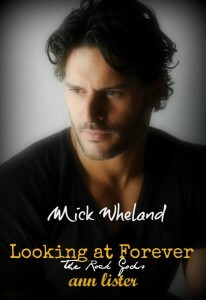 Looking at forver is the 4th book in the Rocks Gods series. This is Mick Wheland’s story, the bad boy guitarist of Ivory Tower. When we met Wheland previously he seemed to be a little conflicted when it came to his sexuality. He has been with a man before but he wasn’t sure if he enjoyed it because of who it was with or if deep down it was being with a man that he really wanted. A one-night stand with another man tells Mick exactly what he needs to know and probably what he knew all along. Being with another man is what he wants. His band mates, who are his brothers and his family, seem to be settling down one by one. He sees the love that they share with their significant others and he too wants that. He wants to find the perfect happiness that his friends have found. Mick is dealing with the anniversary of something that happened in his past by getting drunk, which is what he seems to do on the same day every year. But something happens to him on that day. He crashes into an old friend from the music industry, Sonny Roostarelli. Sonny is back in LA and looking to find a new home. Mick offers for him to stay with him until he finds a place of his own. Mick instantly feels the attraction when it comes to Sonny but is unsure of Sonny’s feelings towards men. As the days go on the sexual tension between the two become so intense that as the reader you can feel how much they want to be with each other and cannot wait for that moment when they both just give in. Sonny and Mick have great, hot and passionate moments together but they both start to feel something that goes beyond a physical attraction. They start to have real feelings for each other that are more intense than they have ever felt for anyone. But Mick is set to go on tour with his band for 9 months. Sonny is no stranger to the music world and knows that for the next nine months, Mick’s life is going to be crazy. So where does that leave him? Can Sonny and Mick really make this relationship work with Mick on the road for so long? Mick and Sonny were hot and passionate together but their love was so intense that you felt it. They may not have known each other that long but the connection was there. There was the comfort and ease that they felt with each other. It felt like they had been together for years. What I loved was that these two men didn’t want want to hide what they had. Mick has not come out to the world yet and as a musician yes he needs to think about how that should happen. But when it came to his band mates he didn’t want to hide anything. He knew who he was and who he wanted to be with and Sonny felt the same way. I loved how open and honest they were with each other with their feelings. They may have ben unsure about how the other felt in the beginning but they let it out They opened up to each other. And they never once were ashamed of what they had together or wanted to hide it. 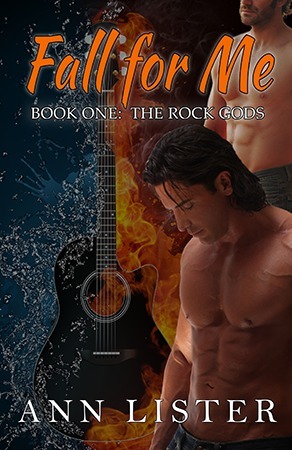 In 2013 Ann released Fall For Me, Book One in a new series, The Rock Gods. Fall For Me was her first full-length gay romance and it was a Finalist in the 2013 Rainbow Awards. Book Two in the Rock Gods series, Take What You Want, released in Fall of 2013. Book Three in this series, Make You Mine, released in May of 2014.